Laolu Akande, the Senior Special Assistant to the Vice President on Media and Publicity releases a press stated which stated the FG’s determination in bringing relief to recently rescued Boko Haram captives and to ensure their well-being in the Internally Displaced Persons (IDP) camps in the Northeast, the Federal Government has conducted an on-the spot assessment at the camp in Bama. At the visit, the delegation led by the Presidential Special Adviser on Social Investments, Mrs. Maryam Uwais restated government’s firm commitment to bringing relief to the thousands of recently rescued Boko Haram captives currently hosted in the IDP camp in Bama, Borno State. “We’re here to see for ourselves the situation on the ground here,” she said. The delegation, which included senior officials of the Borno State Government, officials of the National Emergency Management Agency, the State Emergency Management Agency, and representatives from the United Nations, was taken around the camp, home to 25,000 adults and children, by the Brigade Commander of the 21 Armoured Brigade, Bama, Colonel Adamu Garba Laka. The Commander highlighted the challenges faced by the camp, including shortages of medical personnel, shelter, water and sanitation facilities. Mrs Uwais commended the military for their gallantry and dedication to securing and caring for the displaced persons. 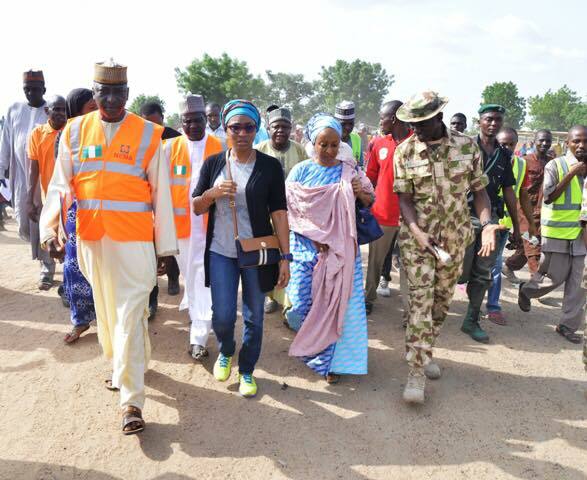 Acknowledging that “this is a crisis situation”, she assured that the Federal Government would work with the State government, international community, local partners and civil society groups to ensure that all the needs of the inhabitants of Bama camp, and the several others like it, are speedily met. Speaking during the visit, the Borno State Health Commissioner, Dr Haruna Mshelia, said that 1,800 of the most vulnerable persons in the camp had been relocated to Maiduguri for medical attention and specialized feeding, and that the relocation is ongoing. He added that a permanent health team had been working in the camp since May 2016, and that the existing team still required a lot of support. The Senior Special Assistant to the President on IDPs, Dr Mariam Masha, assured that, alongside the humanitarian work, the Federal and State Governments are also focusing on the longer-term work of ensuring that the reconstruction and resettlement is effectively hastened to enable the IDPs return to their homes and communities, and rebuild their lives and livelihoods. She added that as the military continues its task of liberating hitherto isolated communities from the grip of Boko Haram, the scale of the humanitarian crisis is certain to increase, and called for increased support from all partners and stakeholders. The six year old insurgency by Boko Haram has already resulted in the displacement of more than two million people across Nigeria, Cameroon, Niger and Chad. In the third quarter of 2015, the Nigerian military launched Operation Zaman Lafiya Dole, and followed this up at the end of April with Operation Crackdown, intended as a final onslaught against Boko Haram in its Sambisa Forest base. The immediate outcome of this determined push has been the liberation of tens of thousands of people from areas previously in Boko Haram captivity. In recent months, no fewer than fifteen new camps have emerged in these newly liberated areas, including the one in Bama. Together, these emergency camps hold more than 200,000 people. Having been held for extended periods of time in areas hitherto isolated by Boko Haram, malnutrition problems brought in while in captivity has now emerged as a challenge that requires urgent humanitarian attention as the rescued persons from the liberated communities arrive in the IDP camp. The development agencies and local partners have continued to support governments’ efforts to address the welfare needs of the displaced persons, but every time new communities are liberated, hordes of hitherto unknown captives are rescued. To that end, the Federal Government, through the Federal Ministry of Health this week declared a nutritional emergency in Borno State, and mobilized a rapid response team to coordinate efforts to ameliorate the situation.